Follow the Album quilt block pattern to make Album blocks that finish at 15" square. The quilt block can be sewn in more than one way, but we'll simplify its assembly with quick piecing methods. The three narrow bars that repeat in my block range from gold to orange and they're set against a deep burgundy/rust print. Most fabrics are repeated in the nine patch units that surround the dark center square. The Album quilt block is suitable for any layout you choose, orderly or scrappy. When making many blocks, add interest by varying the fabrics that will touch when blocks are sewn side by side. It's fine to use the same fabrics, but flip them around a bit. This isn't a requirement, but it adds more variety. **you might need to add a 1-1/2" x 3-1/2" piece of each selvage-width strip. See instructions. Refer to the illustration, but plug-in your own fabric colors. Segment A, the (9) 3-1/2" dark squares, are already cut. To make B Segments, sew the 1-1/2" x selvage width strips side by side lengthwise. My strip set starts with the gold, followed by the brightest orange in the middle, and with the more muted rust/orange on the right. Press seam allowances towards the center strip. Square up one end of the strip set to create a 90-degree leading edge (explained in tutorials referenced on page 1). Remove as little fabric as possible when squaring up. Beginning at the squared up end, cut (12) 3-1/2" long segments. If you are short a segment due to fabric width, cut a 1-1/2" x 3-1/2" bar of the same three fabrics and sew together, matching all edges carefully. Press as before. Make C segments in the same way, but using the 1-1/2" x 12-1/2" strips. Begin with the brightest orange, followed by the more muted fabric. End with the dark strip as shown. Press seam allowances away from the center. Square up one end of the strip set and cut (8) 1-1/2" segments. 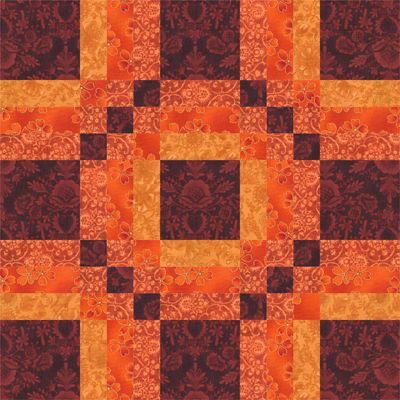 Make D segments by sewing a 1-1/2" x 6-1/2" muted rust/orange strip lengthwise to each side of the dark strip of the same size. Press seam allowances towards the center. Square up one end of the strip set and cut (4) 1-1/2" segments. Arrange two C segments and one D segment as shown, lower left -- dark fabrics will flow diagonally. Sew rows together, matching seam intersections. Press (or wait until block assembly and try to press in opposite directions of adjoining bars where possible). Repeat to make a total of four nine-patch units. To complete the Album quilt block, arrange all components into five rows as shown. Double check placement of fabric in units with bars and nine patch units. Join the rows. Press. The quilt block should measure 15-1/2" x 15-1/2". If it does not, try one of my easy ways to square up quilt blocks. Refer to my index of large quilt block patterns for more 15" blocks (and other large quilt blocks).